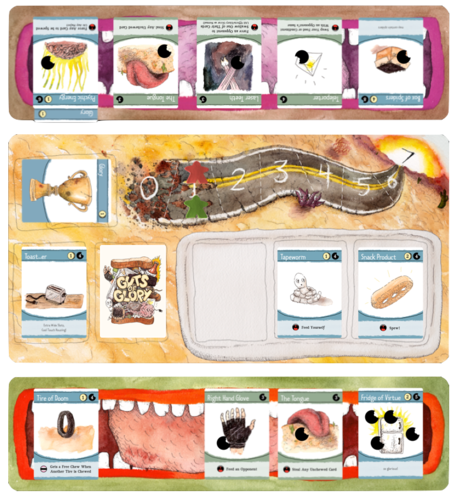 I finally had a chance to play the preview version of Guts of Glory, the post-apocalyptic eating contest board game that we featured on last week's Kickstart the Week. The preview version gives you just a taste of the full game, but you can get it a) for free, and b) right now. Otherwise, you'll be waiting until March 2013 to play this game. I have this issue where I can't wait for anything (it's really bad), so I jumped right into it. It cost me just $5 in printing, but could be much cheaper, or even free, if you have access to a printer at home (or better, at work). Click through the jump for the full preview. Before we go on, I want to show the awesome game boards that will come with the final game. The preview version is a very quick, print and play copy without the full art. So, here is a quick peek at the full art. I've been really excited to try this, and I can safely say that it's as fun as I expected. In the game, players will shove as much food in their mouths as possible, chew it up and swallow for big points. But there isn't always enough room in your mouth, so the players must spew. Spewing is the core of this game. It's the mechanic that takes it from a card collecting game with a cool theme, to a very different and strategic card collecting game with a cool theme. When a player spews, the player to the left gets the spewed card with a victory point card attached to it. That player can take it, and sometimes it'll force them to spew a card. This could technically go on forever, but it's a short game, and at some point you will want to choose not to spew. It only takes 7 points to win, and you are basically giving your opponent a possible-point by spewing in their direction. To spew or not to spew? That is the question. After just one quick play, I went right over to Kickstarter and backed the game. It's one that will play well in my game group (easy to learn, funny content) and one that I can't wait to own. The theme is so unique, and the art compliments it very well.